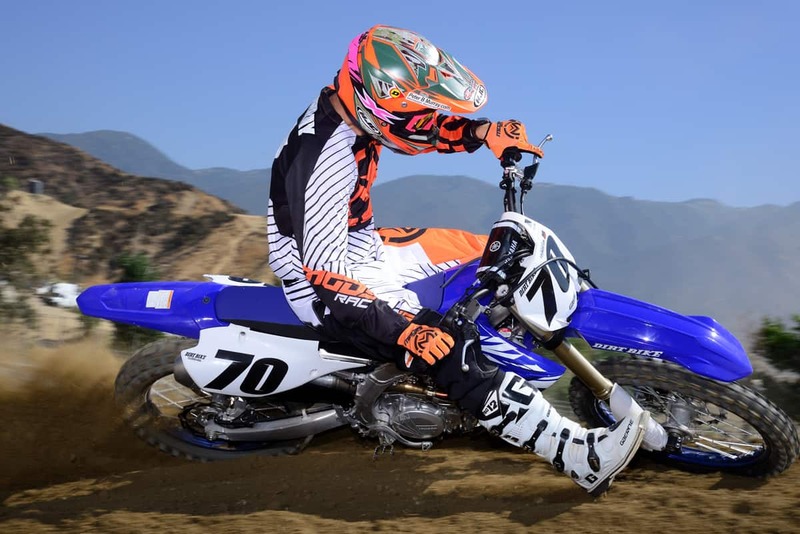 The 2018 Yamaha YZ450F is a completely new motorcycle. Every part has been tweaked and massaged, even though the underlying philosophy is unchanged. It still has the reverse, rearward-tilting top end, but Yamaha engineers looked at every single component and injected some new thinking. It’s a case of evolution meets revolution. If you want a short list, you can look at the stuff that isn’t new. The hubs, the tires and the idea of that backwards head are back. That configuration makes the motor look kind of similar to the previous model, but the top end is 2 degrees more upright, shifting a little more weight to the front of the bike. The intake port is straighter, the cams have more lift and there’s 8 degrees more valve overlap. Under those valves sits a new piston with a bridge-box design. The crown thickness is reduced by 2.3mm, and the overall weight is marginally less (6 percent). The compression ratio is a bit higher, going from 12.5:1 to 12.8:1. The head pipe is 12mm longer and 3mm smaller at the middle junction. In a real surprise, the throttle-body supplier has changed from Keihin to Mikuni. Mikuni isn’t new to this; Yamaha was already using Mikuni for the YFZ450 quad. It now has a push/pull cold-start knob, kind of like a choke, and a more compact throttle-position sensor.Even the lower end has big changes. The crank has a different balance ratio and less inertia, which isn’t exactly the same thing as less weight. You can have a lighter crank with more inertia if most of the mass is moved away from the center of rotation. Yamaha did something along those lines, but then decreased the inertia of the flywheel, so the net result should be about the same as last year. Now that there’s a battery on board, the new electrical system isn’t quite as power-hungry, according to Yamaha engineers. That enabled them to downsize the generator. Apparently, the generator creates its own drag, and the previous YZ450F produced more electrical power than most other 450s. Second, third and fourth gears are 1mm wider each. Despite having the best clutch of any Japanese bike, Yamaha made changes there too. The pressure plate was redesigned to flex more in the middle and less on the outer edge to allow a little more feedback to the rider. The plates and springs even have slight changes.The most obvious change is the lack of a kickstarter, which is a full commitment this year. There’s no hole in the case that allows you to change your mind. The YZ450FX off-road bike lost its kickstarter last year, but you can still get all the parts and install your own, if you want. Not so here. The lithium battery sits under the seat, which, in this case, has no effect on the intake because the Yamaha’s air filter is still way up front where the gas cap usually is. As usual, the YZ’s fork is outstanding. You don’t need the adjustability of air if it’s right to start with. For years Yamaha was a maverick among Japanese manufacturers in chassis design. 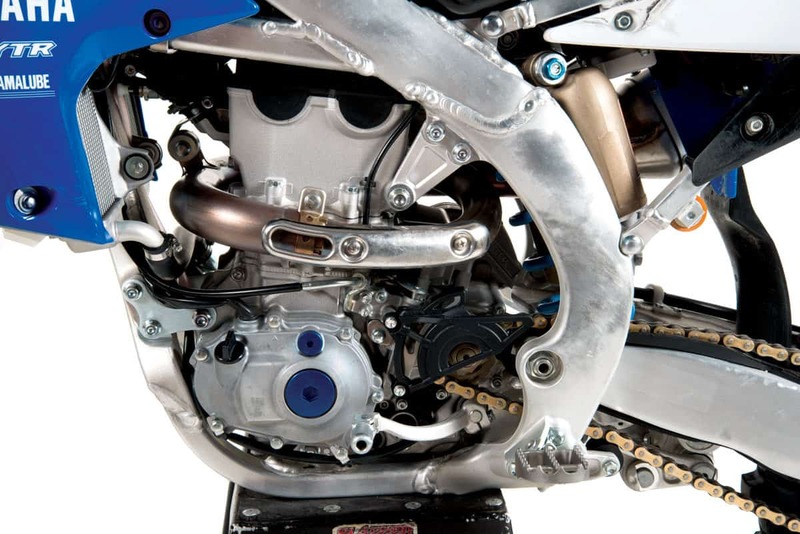 The YZ450F frame was always very different. The 2017 model had kind of a gentle S shape to the main beams, presumably for more flex. That’s gone. The new frame has much bigger, straighter beams coming back from the steering head. The head stay was relocated from the front to the back of the head. All that resulted in 25 percent more vertical rigidity, according to Yamaha, with lesser increases in horizontal and torsional rigidity. The steering head is 6mm farther forward, and the triple-clamp offset was changed from 25mm to 22mm, resulting in a 3mm increase in trail. That change was popular in the aftermarket last year. The wheelbase is 5mm longer, the handlebar is 5mm higher and the rear of the seat is 19mm lower; in other words, the rider will be in a completely different place. The rims and bars are said to be stronger too.There are suspension changes too. This has long been the Yamaha’s strong point, so we’re not talking about world-shaking stuff. It still has a KYB coil-spring fork, but the piston size is increased slightly and there are differences that affect damping. The shock has a larger reservoir and a stiffer spring that’s 210 grams lighter in weight. Everything is wrapped in new plastic. The airbox lid is a little easier to remove, the fuel tank is narrower and so is the seat. Even the radiators are new and mounted 6mm closer to the frame. Even if you didn’t know all the details about how completely and totally new the Yamaha is, you would know from the moment you sat on the bike. It feels nothing like the previous YZ450F. The bars are high, the seat is low and you feel like you’re sitting in the bike rather than on it. The older YZ also felt fat across the front, whereas the new one feels much smaller and narrower. Then you reach down for a kickstarter that isn’t there. 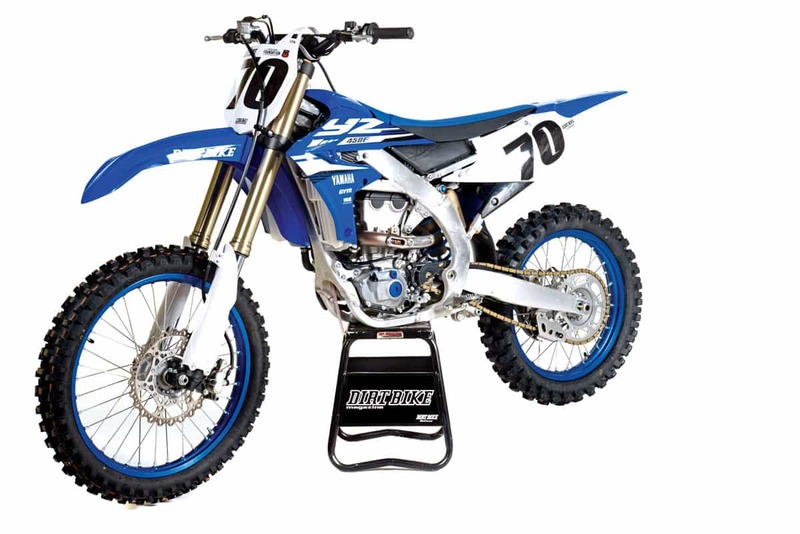 The YZ fires up instantly when you find and press the button. We haven’t had the opportunity to ride it on a really cold day, but so far it’s one of the quickest-spinning and -starting 450s we’ve ridden.If you’re really familiar with the way Yamahas handle, though, you’ll recognize what comes next. 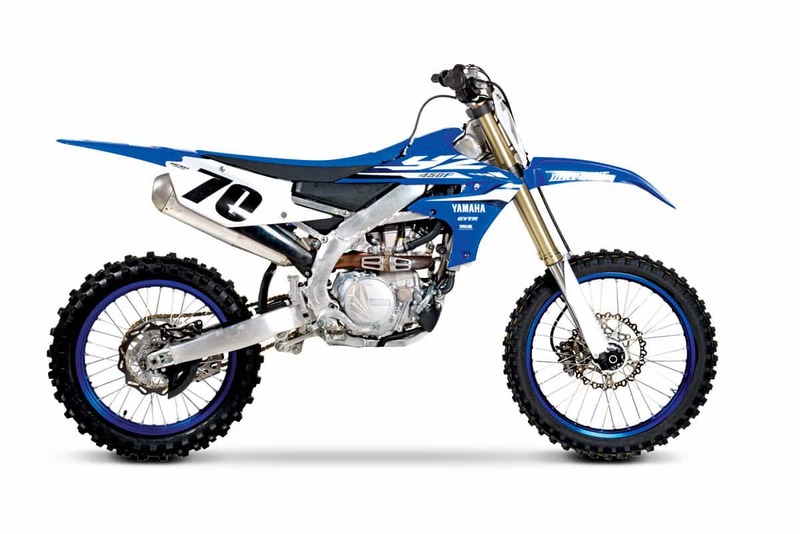 The new YZ450F, like every one before it, likes to go fast. Beyond that, it likes riders who like to go fast. The YZ is still a bike that handles better and better the more you gas it. It turns better when the throttle is open, it’s more stable when the throttle is open and it’s more confidence-inspiring when the throttle is open. We’ve always said that Yamahas turn with the rear wheel, and that hasn’t changed, no matter how much different the rider position is. This year the bike gives you another way to get through turns too. You can steer your way through a corner without bringing the rear wheel around, but only if you exaggerate your riding position. When you climb way forward over the front wheel, you don’t have to be so aggressive, and it will coast through a turn just like a Honda or a Suzuki. The only issue is that it’s not as quick as doing it the old-fashioned Yamaha way of twisting it hard and swinging the rear end out.Yamaha recommends about 100mm of sag in the rear suspension, and with the new layout this year, that makes it feel kind of low in the rear when you’re setting things up. As soon as you get on the track, it feels about right, so it’s best to resist the urge to add more preload. In fact, bigger riders usually like the bike with less preload (more sag). When it was set to around 106mm, it tracked straighter and the rear suspension was still very calm. Suspension, by the way, is still as good as ever. We were a little concerned that part of the YZ fork and shock magic was in the frame and that more rigidity would wreck everything. That’s not the case. The Yamaha’s suspension is still universally loved. The fork, in particular, got rave reviews from riders across the board. Funny, the best argument for air forks is that they’re more adjustable and can be made to work for a wider variety or riders without spring changes. The Yamaha’s coil spring seems to appeal to a wide variety without any changes at all. 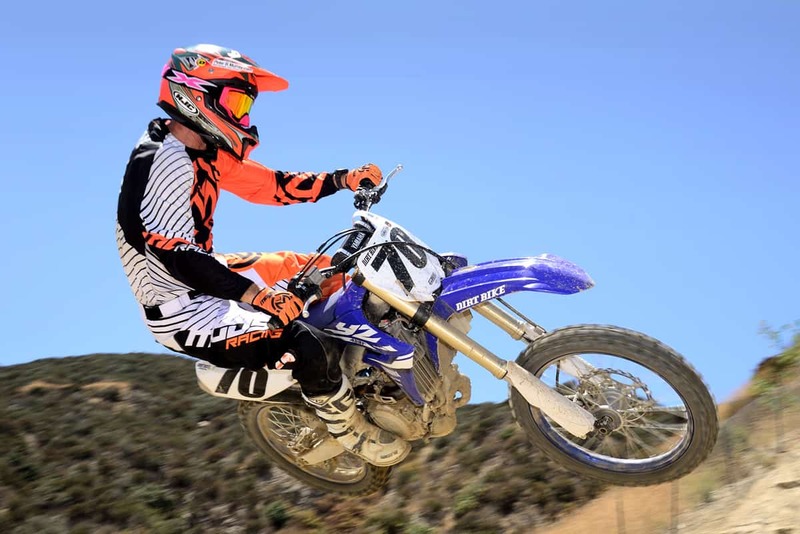 Sure, if you’re under 150 pounds, you might have to invest in softer springs, but what really sets the YZ apart is that the standard setup works for an amazingly wide cross-section of riders. The motor is 2 degrees more upright this year, sitting 6.8 degrees rearward of vertical. Let’s talk about power. The Yamaha is like the Hulk: when it’s angry, it’s one of the most powerful things on earth. It’s the single-most-defining trait of the YZ450F. It was like that last year, and it gained a little more through the middle for 2018. The hit in the lower midrange is a little smoother now, but it’s still so fast that most riders never really open the throttle all the way. When you do that, you better have room and you better hold on tight. 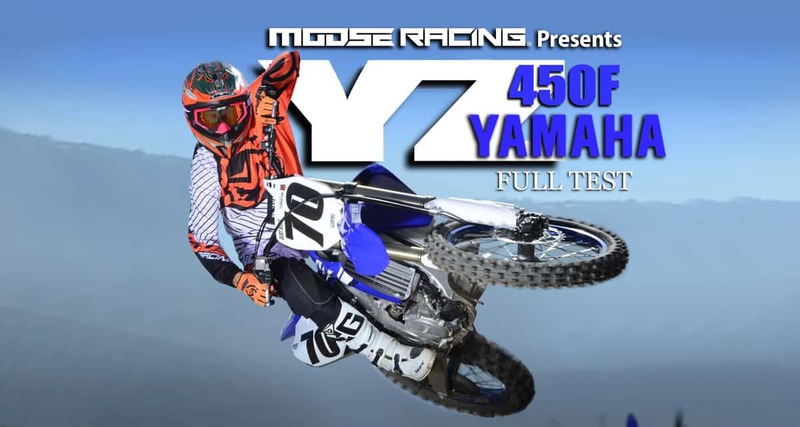 Even with so much power on tap, the YZ isn’t especially hard-hitting, at least by 450 standards. We’ll go so far as to say it’s a little like an old-school thumper in power delivery. The standard maps on the Honda, KTM and Husqvarna all have some point where they ramp up hard and fast, whereas the Yamaha’s power is more gradual. This is all adjustable nowadays. The Yamaha doesn’t have a handlebar-mounted map switch like those bikes (aside from launch control), but it does have the most advanced user interface for altering the EFI system. The Yamaha Power Tuner used to be a handheld device sold through Yamaha dealers. Now it’s a free phone app. Any smartphone can be used to connect to the bike’s CPU through WiFi. A password-protected system allows you to adjust fuel and spark advance, as well as run diagnostics and race-log information. It works amazingly well and allows you to alter the bike’s power delivery. You can make it hit harder or you can detune it. There are a couple of default maps preloaded, and there’s a world of testing that you can do to cook up your own. It’s the most dramatic single advancement of this bike, including the move to electric start.Speaking of that, one area that hasn’t advanced is the bike’s weight. Last year most riders complained that the bike felt heavy. It was heavy. On the eternally unbiased Dirt Bike analog scale, the 2017 YZ was 237 pounds without fuel—tied with the Suzuki as the heaviest bike in the class. This year the bike gained 2 pounds with the addition of electric start. That’s pretty good. Years ago we thought that an electric starter and battery would always cost about 20 pounds. Still, no matter how much mass centralization has been engineered into the bike, it can’t disguise that it weighs 239 pounds and is 15 pounds heavier than a 2017 KTM 450SX.When you combine the weight with the fact that the bike is so powerful, you have a beast. 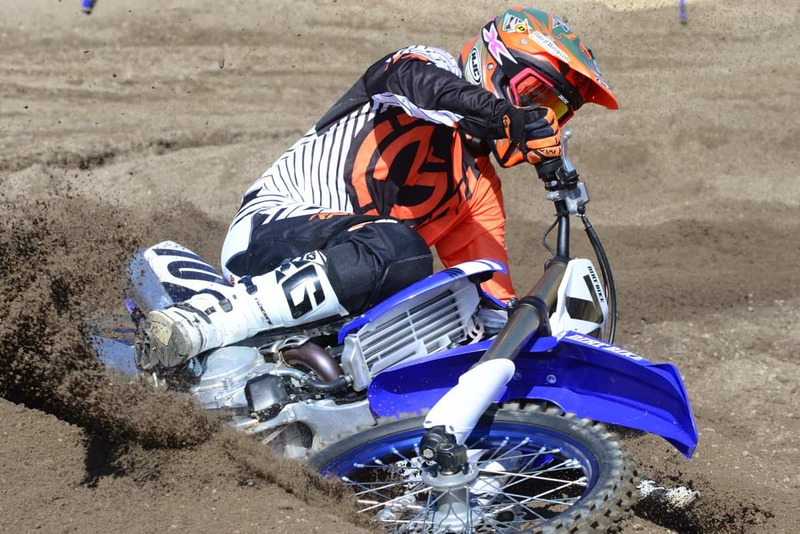 The YZ450F can still wear down strong men in short order. Yes, it’s narrower this year. Yes, the power is smoother. Yes, it can be steered through turns more easily. None of that changes the fact that it’s still a big, heavy, unnaturally powerful motorcycle that requires strength and commitment. 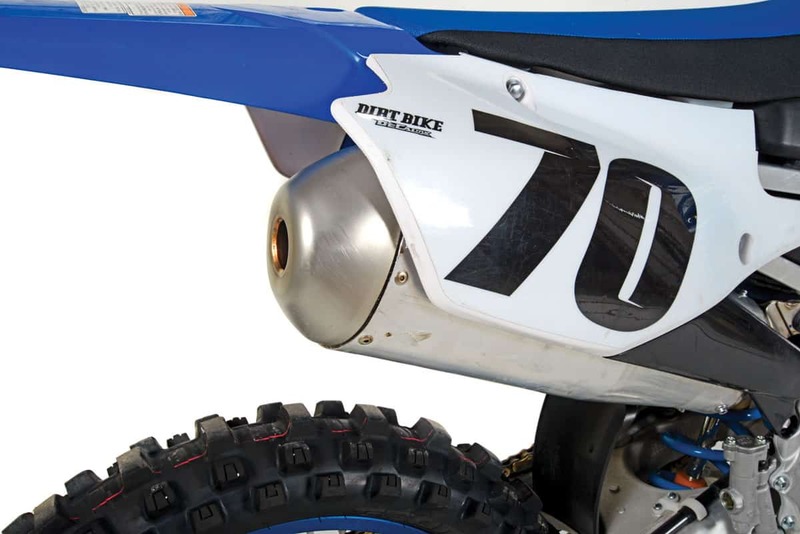 When you ride the YZ, you hear a lot of intake noise. The exhaust noise is about average for a modern 450, which means loud. As all 450s approach the point of diminishing returns in the horsepower race, Yamaha is making all the right moves. With a truly usable means of engine tuning, Yamaha is acknowledging the fact that all riders are different and have varying abilities to deal with so much power. Not everyone’s a pro. Yamaha gets to compete with KTM and Honda in the all-out horsepower war and offer a workable solution for the average rider. And even though this is a new motorcycle, there’s a long list of things we’re delighted that haven’t changed. It still has the best clutch of any bike from Japan. It still has an oversize handlebar. The air filter is still well sheltered, stays clean and now it’s even easier to access. By staying with all those things and continuing to make suspension the highest priority, the 2018 YZ has a broader appeal than ever. Everything is new on the 2018 YZ450F, but all the defining traits that make it a Yamaha are still there. Fuel tank capacity … 1.6 gal. Weight, no fuel … 239 lb.